The candidate of the Peoples Democratic Party for Delta Central Senatorial District, Evelyn Oboro, on Friday said her life was in danger. Oboro, who represents Uvwie, Okpe and Sapele Federal Constituency at the House of Reps, also accused the state police command of complicity for allegedly refusing to protect her. The lawmaker told The Punch that she had been receiving strange calls from unknown political thugs threatening to kill her if she did not pull out of the race. She noted that her application for police protection was declined for no cogent reason. Oboro, in the same vein, accused the police of arming her opponent, Senator Ovie Omo-Agege, with truck loads of policemen, who he allegedly uses to intimidate her supporters and other political leaders in the senatorial district. She said, “I applied to the Nigeria Police that I will need security coverage for my campaigns and I was denied. 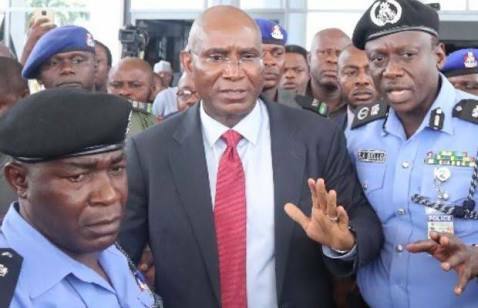 “But surprisingly, for the past two weeks, the APC candidate (Omo-Agege) has been campaigning round the senatorial district with 13 trucks of policemen. Police armoured cars are following him. “He is intimidating my supporters and members of Delta Central. He is boasting that he would arrest me, incapacitate me and he would lock my house down like they did to some members of the National Assembly. Oboro appealed to the Acting Inspector General Police to direct the Delta State Police Commissioner to urgently deploy policemen to protect her, noting that threats to her life should not be taken with a pinch of salt. While stressing that she would win the election, she also lamented the destruction of her campaign posters by thugs suspected to be loyal to her opponents. “I am the candidate to beat in the election. I am the most popular candidate in the race. No Urhobo woman has ever been elected to the National Assembly except me. “I am currently in the House of Representatives. Public opinion shows that I am the most popular candidate. “I am raising this alarm to alert the Acting IGP that between December last year and now, they have transferred all the Divisional Police Officers from Delta Central. “Policemen from ranks and files are being transferred from Delta Central in fulfillment of the plot to use federal might to rig the election in favour of my opponent,” she added. When contacted, the Police Public Relations Officer of the Delta State Police Command, Andrew Aniamaka, said he was unaware of the application by the PDP senatorial candidate for police protection.